We have gay cockroaches in our condo. I know they are gay. In fact, I am convinced that our condominium is the San Fransisco of the cockroach world. In my opinion, nothing as dirty and disease-ridden as a roach could be a girl. Before you wax all scientific on me, I know that it is physically impossible to have all male cockroaches. I especially know this after taking time to read the Wikipedia article about Blatella Americana, which informed me that a female roach only needs to be impregnated ONCE to be able to lay eggs for the rest of her life, allowing one single cockroach to lay over a million eggs during her lifespan. Can you imagine? One bad night and a million kids later, you still might not know who the father is. However, I keep telling myself I just have yet to see a female roach. Surely a female roach is pink and purple, smells like begonias and has glittery antennae. Without these redeeming feminine qualities, she is a heinous mockery of womankind. So I must not have met a female roach yet -- not that I'm upset. Therefore all the ugly, creepy brownish red ones we've seen must be manroaches. They are nasty. But we find them in places that only gay male cockroaches would linger! A heterosexual male roach would be found watching SportsCenter on our couch, or chomping merrily through the bag of potato chips. But not our roaches. They're gay. The first one we found was loitering in the kitchen, on the shelf with all the baking products. What kind of manroach hides between whole-wheat flour and PAM spray, reading the recipe on the bag of the Nestlé chocolate chips bag? A gay one that wants to put on an apron and bake gay roach cookies, that's what kind. The next two we saw were in the bathroom. Christy had the good fortune of finding one in the shower with her, while I had the privilege of finding the other one on my towel milliseconds before drying off with it (which unfortunately resulted in my constant twitching all day long since I felt like a roach was crawling on me the entire day). What kind of manroaches spend prolonged periods of time in the bathroom with all the hair products and bubble bath and whitening strips? A gay one that probably eats hair gel, that's what kind. The one Christy found this morning was so gay that it might as well have had rainbow wings. She found it in her makeup bag. Oh, hell no. What kind of fruity, queer manroach crawls to the bottom of a makeup bag, navigating eyeshadow and blush before wedging between a powder compact and eyelash curler? A gay one, that's what kind! I fully expect the next roach I see to greet me with a "Heeeey, girl - howyabeen?!" Why did Noah take roaches on the ark? Why did God even make them? A cockroach can survive up to a month without a head or food and can also hold its breath for 45 minutes. But MOST disgusting of all, and this really does take the cake: they leave chemical trails in their feces! Other cockroaches will follow these trails to discover sources of food, water (and makeup) and where other roaches are hiding. This is not normal!!!! If I see a pile of poop in my path, I'm going the opposite direction. Never once have I seen feces of any kind and thought "Oh goody; it's a clue!" So for now, they're here, and they're queer. At least until I call pest control. Enjoy it while you can, gay cockroaches. Your days are numbered. They could be Metro. Just wantin' to get a little closer to the ladies. MIght be time for an exterminator call. Did you ever see the short lived MTV show, Welcome to Joe's Apartment. First of all, I think you mean the movie "Joe's Apartment," which was produced by MTV and released in 1996. Second of all, I think you just gave away your age. Lindsay! This is the best blog entry ever! I loved it and laughed out loud the entire time. Brilliant! '96 huh...What, were you 10 then? BTW girls. Time to clean the dishes and wipe the crumbs off the counter and out of your britches, makeup bags and towels (gross). Or else Papa Roach will sing you a new diddy. "Follow me now everything is alright. I'll be the one who creeps you out at night. If you're gonna leave I can gaurantee there'll be 10,000 others just like meeeee...."
Did that song come out in '96??? HEY - I was 13, and we are NOT dirty people. Our condo is cleaner than most. It's just that we're so sweet and fun, that's why roaches want to befriend us. But I love the song. Well done. How long did it take you to come up with that? Came to me with the quickness. Faster than a roach fleeing the scene when the light comes on, or when the towel flies off the rack. Hope you had a good trip. Hurry home. I just barfed in my mouth. Call Pest Control. TODAY. this is wonderful. 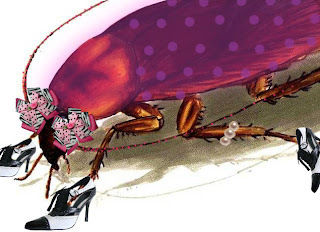 i love the image you have created of a gay cockroach. i think probably they indeed look just like that. my years in auburn taught me that i hate all cockroaches, gay or hetero, no matter where they are.